Helping you and your vehicle! Kuchta's Automotive Offers Auto Repair Services You Can Count On! 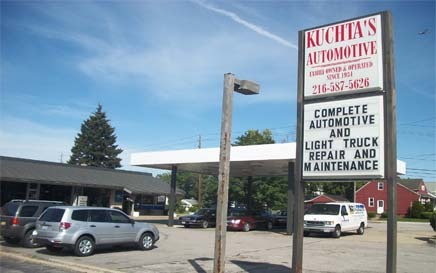 Kuchta's Automotive has been providing customers in the Maple Heights, OH 44137-1015 area with high-quality automotive maintenance and repair services since 1934. Our experienced mechanics will get your vehicle up and running again, and we'll keep it in top operating condition. We provide a range of services, including 4x4 Services, Alignment, Brakes, Car & Truck Care, Domestic Cars & Trucks, Electronic Services, Engine Maintenance, Heating and Cooling Services, Import Cars & Trucks, Miscellaneous Services, Quick Lube Services, Tires, Transmission Services and Undercar Services. We're proud of our great mechanics, who have years of experience working on many different types of vehicles. They have the knowledge required to diagnose your problems, and to find affordable solutions to get you back on the road quickly. To learn more about our services, call us at 216-587-5626 or email us today. We're looking forward to earning your trust as a friendly, honest and reliable alternative for your auto maintenance and repair needs in Maple Heights. I've been going to Kuchtas for over 25years and can honestly say these guys are the best thing to ever happen to my cars. They always do great work, prices are always reasonable, and are always polite and friendly. Truly one of Maple heights hidden gems! If it's not under the warranty , Kuchtas is always my only choice! Affordable, fast, friendly automotive repair service on Granger Road. Honest owners give accurate estimates. Small waiting room with tv & vending machines if needed. People are genuinely kind. Prices competitive. Will honor guarantee on work. Best mechanics in the business, family owned for 3 generations. Very efficient & very up to date . Very reasonable prices & very good service. Highly recommendable. !!! They always take care of me right away and they're very fair. Very nice service. All the guys we're nice and helped with service in a timely manner. Overall experience was Great! Today was my first experience at Kuchtas and was very impressed. Great customer service and fair prices. My van broke down on my way to work at the gas station across the street. They were able to give me an estimate and fix it same day! It's not close to my house but will bring my van here again! They have ALWAYS treated me right. I have been coming to Kuchta's for about 10 years. They are very fair priced. And I have never had to return for the same problem. In 35 years of car ownership they are literally the best mechanics I have ever gone to.